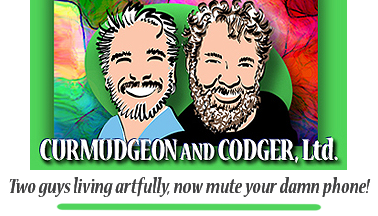 Khrysso is a Curmudgeon – Curmudgeon and Codger, Ltd.
Khrysso Heart LeFey is the curmudgeon in Curmudgeon and Codger. More picky than crusty, he wants things done right and doesn’t rest easy until they are. Serves him well when he’s editing a manuscript or writing a blog entry (what we used to call “essays” back when he was first honing his writing skills), maybe not so well when he’s improvising a piece of art and needs to suspend his inner censor for a while. He has managed to overcome that censor well enough to create work such as you can see at www.theartistslefey.com. 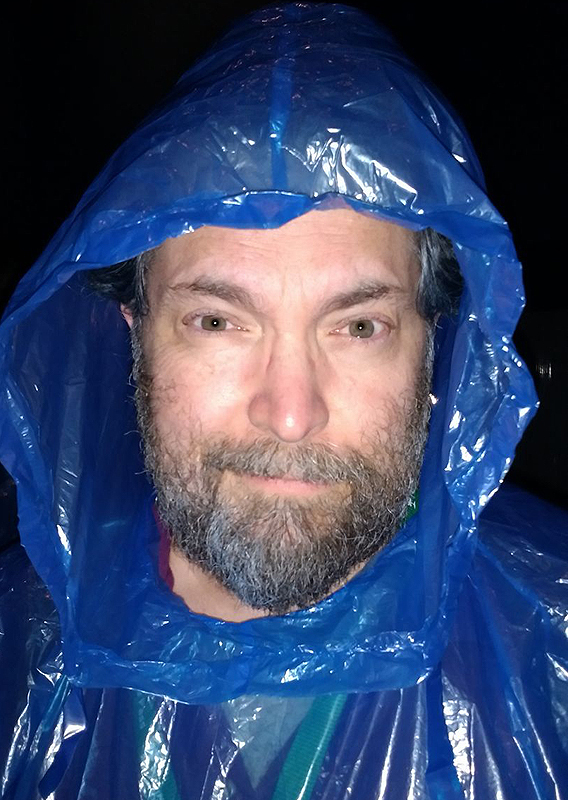 Khrysso’s own writing has mostly been in the realm of non-fiction since he first identified writing as a career path in his teens. He has written poetry since those days as well. Having studied Rhetoric and Composition at the graduate level at Ohio State, he learned that most of the skills he needed as a non-fiction writer were transferable to the realm of fiction and have served him well as an editor of novels and short stories. He has taught and tutored writing in addition to editing fiction and scholarly work. Folk music has been with Khrysso all his life, but it captured his imagination as the predominant way to spend his time beginning in his late twenties. He has played guitar since his teens and took up the mountain dulcimer as he approached thirty, the age at which he also added the chorded zither (Autoharp) to the instruments he played on stage. He spent most of this thirties performing, researching, recording, and teaching folk and traditional music styles and still enjoys digging into the origins of old songs. With his publishing partner Sandi Vitek he is the co-founder of Worldberry Jam publications, which deals in folk and acoustic music, particularly for the dulcimer and other diatonic instruments. Khrysso has been involved in making ritual and worship happen since he became a choirboy at age eight. He has in the ensuing half-century explored many spiritual traditions inside and outside the realm of the Church (Catholic, Evangelical, and liberal Christian and Unitarian Universalism, which because of its roots in Congregationalism Khrysso considers “within the realm of the Church”), usually staying close to the action of designing and executing ritual and worship in some way. He has a Master of Theological Studies degree from the Iliff School of Theology, a graduate theological school in Denver affiliated with the United Methodist Church, where his studies focused on both ritual and pastoral care. He spent two years on the continental board of the Covenant of Unitarian Universalist Pagans while he was in divinity school. He is now a clergymember with the Church of Spiritual Humanism and is vested with the power to officiate at weddings in the state of Ohio. He considers ministry to be every bit as much an art as literature, music, and visual art. He was surrounded by visual art all his life; his mother was a History of Art major in college and his big sister is an art teacher. 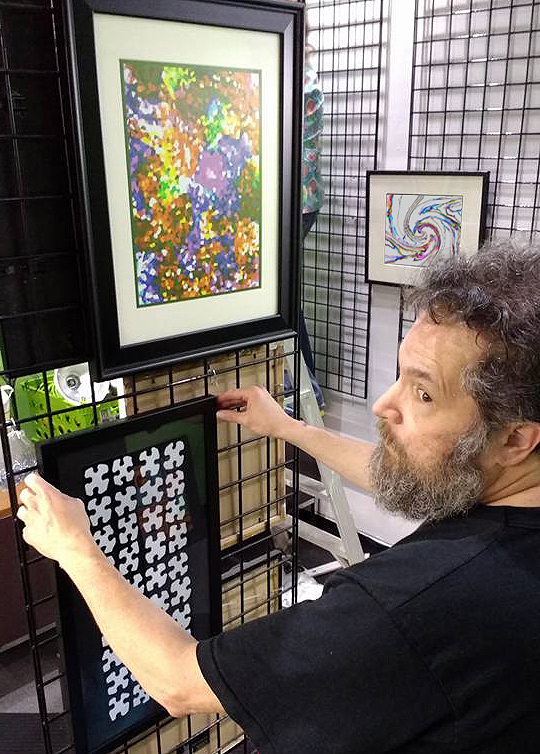 It was primarily after he graduated from Iliff in 2002 that he turned his own attention to creating art, primarily to paper collage, which he eventually began to digitize. He and his husband, Grey Forge LeFey, were co-owners of Artful Codgers and Crones gallery in Canton, Ohio before taking their digital work to their online gallery at www.theartistslefey.com.